Squeak’s virtual machine simulator is extremely useful for debugging. You can use it to inspect and change objects “while time is stopped”, between the execution of individual virtual machine instructions. Traditionally, though, it takes an address-based view of objects. There are several useful utility methods which, given an object address, will print useful information to the Transcript. Wouldn’t it be nicer, though, if you could use normal inspectors to look through the fields of the objects in a simulated virtual machine’s object memory? I created simulated objects for this purpose. They are instances of a SimulatedObject class; each one has an interpreter and an address. They can print useful information about themselves, like the interpreter can, but they can also modify themselves and interact with each other, changing the interpreter’s object memory appropriately. Are you wondering about the instructions of a compiled method? Would you like to make a few choice modifications to those instructions? A simulated object for that method’s address will help you. Simulated objects play nicely with Squeak’s object inspectors, and, more importantly, with its object explorers. You feel like you’re inspecting normal objects, except that you can’t send normal messages to them. Or can you? I’m pondering this. It might be useful, for example, to terminate a process in a simulated interpreter’s object memory, without having to do it in another process. Time is stopped, but perhaps you could queue up messages to send when it starts again, through a collaboration between simulated objects and a coordinating object in the memory they describe. I’ve been using simulated objects recently to chase references with the absolute assurance that I won’t be creating new ones. They’re very useful for debugging virtual machine primitives. Sometimes, when I’m debugging a headless system with a broken remote messaging system, it’s the only user interface I have for inspecting things. And it’s sure a lot nicer than inspecting things in a C debugger. I have debugging working for remote unhandled exceptions. My motivating use case was debugging messages not understood by the Context console’s embedded web server. The console is a headless app. In development, I run it with a remote-messaging connection to a headful system. Now, when there is an unhandled exception (like a message not understood), the exception requests that the headful system open a debugger (as its default action). Before opening the debugger, the headful system replaces the sender of the first relevant context on the headless system with the last relevant context on the headful system, hiding all the remote-messaging-related contexts in between. The picture above shows an example of this. On the headful system, I sent “zork” to an object on the headless system. 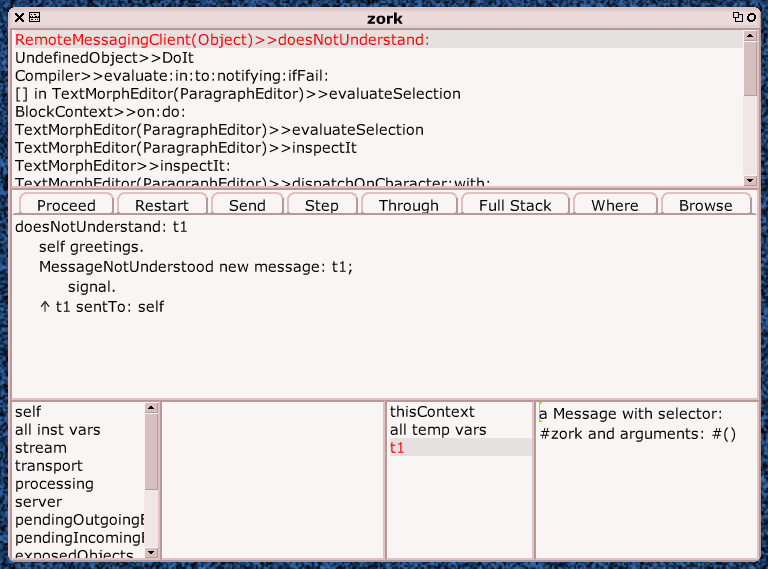 The debugger shows a continuous context stack which spans the two systems. This all works with little special handling in the debugger because of the complete transparency of remote messaging. It doesn’t matter that the contexts and methods that the debugger is manipulating happen to be remote. Here’s the current README for the IDE app. And oh yes, I’m considering renaming the project from “Spoon” to “Context”. Hi, Context 3 beta 5 is released. I’ve still got a bunch of changes pending, for a 3b6 release to follow shortly. This release is just to fix some startup problems on Windows, Linux, and Mac OS. You can also find the Spoon VM changes separated out, in the second “Resources” folder. What I’d like is for you to just start the app and tell me the results, along with your host platform. Thanks!